TYrannosaurus rex, Triceratops Family. Triceratopses defending their youngsters against Tyrannosaurus rex. Framed in black flat frame. Giclee on canvas is stretched on wood bars. Size 30" x 24" (76 cm x 61 cm). Original oil painting by Josef Moravec. Note: Watermarks and Copyright markings do not appear on the final photo quality giclee canvas. 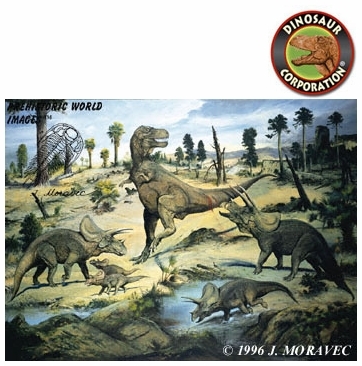 ▪ Trex, Triceratops, Dinosaurs Picture, 8.5" x 11"